AEROSPACE engineering student Wee Hong Jie used to think that air traffic management was "a mundane thing" - just a matter of giving commands to planes. But he is learning about the complex calculations behind that, in a 20-week stint at the German Aerospace Centre (DLR). "We actually do the research that (results in) the set of instructions," said the 24-year-old. Thanks to such internships, he and other third-year Nanyang Technological University students have the chance to be at the cutting edge of aerospace research. At the DLR in Braunschweig, Germany, Mr Wee is helping to study an unconventional approach to plane arrivals. Research today tends to focus on complicated tools that tell air traffic controllers exactly what commands to give to planes. Instead, this project just calculates the best order for the planes to land, then lets the controller decide what commands to give for how each plane should come in. 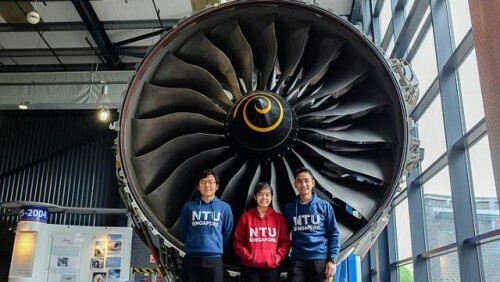 At the Rolls-Royce facility in Derby, Britain, fellow aerospace engineering student Izzat Roslan is also in search of a new method. The task: masking, or protecting specific parts from being affected at stages of manufacturing - like using masking tape to keep areas unpainted. It is now done by hand. Mr Izzat is helping to see how it can be automated instead. "In school, we learn about manufacturing processes. But here we learn about the future of such processes," said the 23-year-old. Though there is a Rolls-Royce facility in Singapore, the three interns in Derby say that just being overseas is a valuable experience. Said materials science student Tan Zi Ying, 21: "You have a real feel of how it is like to work with people from different cultures." Mr Liang Hongde, 23, is testing a software to see if it correctly models the physics involved in the process of casting. The work is complicated, but there is also a simpler allure to working with such an established firm. "This itself, being part of Rolls-Royce, is very meaningful to me," he said. He recalled how, at the start of their internship in February, they were led around the heritage centre by a former engineer. "He pointed at one old engine, telling me that he was the one involved in making that part.